Brain injury is one of those injuries that we’ve pretty much always had with us. It’s been possible to sustain a TBI since time immemorial. Getting clunked on the noggin, falling and hitting your head, getting in fights, crashing your car/bike/wagon/sled, having something fall on you or run into you and knock you out — all those things have been happening to the human race for as long as we’ve been around. It’s only recently that we’ve developed the awareness around how serious a concussion or TBI can be, and over the past 10 years, it’s become painfully clear just how bad for you it is, to repeatedly hit your head against something. CTE in football players (of all ages)… in soccer players, hockey players… to an extent that now appears to rival dementia pugilistica in boxers. At least in terms of press and public attention. And of course there is the signature injury of the Iraq/Afghanistan conflicts — TBI and PTSD. It’s no joking matter. It’s also not exactly new. I’m not downplaying the seriousness of it, however for ages, soldiers returning from war have been seriously messed up. My father-in-law, who fought in WWII and came back a raging mess (and turned many members of his family into messes in the process), was a prime example of what war does to your brain, your behavior, your relationships. He was a great man, no doubt, but to say he was “haunted” would be an understatement. My question is this: If TBI has been around since the beginning of time, how is it that it messes us up so much more now? Because it seems to. It really does. My own “minor” TBI in 2004 almost ruined me. I nearly lost everything. And over what? A fall down the stairs, when I smacked the back of my head 3-4 times really hard? 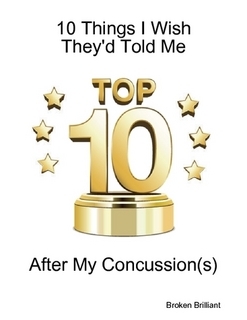 Plenty of other people (including the author of “The Ghost in My Brain”) have relatively “mild” concussions, but find their lives turned upside-down, even ruined. And life after a TBI becomes even more traumatic than the injury itself, in many, many ways. So,what’s different now than before? Something must be. I think it’s a combination of things — people are different now, and our bodies are much less used to taking physical beatings than before. We also have far fewer institutional guidelines of how to behave and relate to each other and the world, that tell us what to do and if we’re doing it correctly. Once upon a time, there were commonly agreed-upon moral codes that everybody followed. You didn’t have to figure everything out for yourself, and it was clear if you were not falling in line — so you did. And I think that actually made it easier for TBI survivors to figure out how to fit in. The lack of physical strength and resilience, plus a lack of hard and fast social guidelines, make TBI recovery a tougher journey. Plus, we live in a world that’s a lot harder and faster and stronger than it used to be. We drive our cars faster. We play our games harder. We have all sorts of artificial, chemical, and mechanical enhancers to make it so. But we ourselves are physically weaker and less well-conditioned all-around. But I think the one thing that makes TBI recovery the hardest, nowadays, is the rigidity and brittleness of society. Gender roles are more clearly divided than ever before. Even with all the “alternative lifestyles” folks in the mix, the distinction between who is perceived as “a man” and who is perceived as “a woman” is clear and unwavering. Girls have soft pink toys that are usually about dolls and homemaking. Boys’ toys have to do with war and hard sciences. As adults, our lives are expected to be a certain way — we’re supposed to have a regular job, making decent money, live in a respectable neighborhood, where we raise a family and do the whole mainstream thing. We’re supposed to be on Facebook. We’re supposed to text and tweet and share photos on Instagram. It’s not negotiable. If you don’t participate in things like fantasy football, put your kids in youth sports or dance classes, pursue various volunteer activities supporting the charity of your choice, and use catch-words like ‘positives’ and ‘negatives’ and ‘maximize’… well, you’re “out”. You’re not part of the action. And that’s supposedly a bad thing. If you choose a different way — drift between jobs, changing up every couple of years or so… make so-so money at one job, make really great money at another, not staying on an “earnings trajectory” that takes you up-up-up… you don’t have kids, or if you do, you don’t bring them up the way everyone else does… you don’t go to the holiday parties or sign up to help remove invasive species from the local waterways… and you use words that are definitely not catch-phrases, well, people don’t quite know what to do with you. And that makes a TBI survivor even worse off than ever. Because after you hit your head and get hurt, you can’t always do the same things that everyone else is doing. Sometimes you can’t handle the noise or the lights or the crowds. Sometimes you lose track of time. Sometimes you just don’t have the energy to do anything at all. Sometimes you lose your words between when they’re in your head and when they come out of your mouth. So, you’re out. And when you’re out, you lose your support. You lose your contacts. You lose your connection with the things that used to make you who you are. You lose the identity you have with those people. And you lose the opportunity to interact with others and modify your behavior in ways that make sense to you and to them. The thing is, people can be so brittle. They can be so afraid. The littlest thing will set them off, and they push away people who make them uncomfortable. Even wearing your clothing a little differently than expected can freak people out. So, where does that leave us? Personally, I think people need to loosen up. They’re too tightly strung, too intensely wound up. In the end, you learn that all the worry and all the concern over details and minutiae just distracts you from what really matters, and you reach the end of your days, wondering “What the f*ck was I thinking?”. I know what you were thinking — just like everyone else, if you don’t get with the program, you’re going to be kicked out. You’re going to lose everything. And it’s not going to be pretty. Of course, there’s nothing you can do about the behavior of others, so what’s a TBI survivor to do? First, you can cut yourself a break — your brain’s been injured, and it needs to heal. Like healing a bone or a bruise, you need to rest it, give it proper nutrition (and water) and not do things that can hurt it again. Second, rest assured that your brain will change over time — our brains are constantly changing, in contrast to what the narrow-minded, unimaginative, ideologically domineering dinosaurs of the medical profession have told us for the past 150 years. We learn, don’t we? (Well, some of us do, anyway.) Learning and adapting to changing conditions is all part of our brains changing. Third, know that you can change your brain in ways that make sense to you — and that you want it to. The brain changes in connection with its environment — and we have at least some control over that. We can choose where we go, what we do, who we are around. Of course, it can be both a very long process — it’s taken me ten years to get to a point where I feel like myself again on a daily basis — and a very quick one. I’ve had sudden leaps ahead for no apparent reason. Lastly, the rest of the word isn’t necessarily going to cut you a break, but you can give yourself the break you need. It’s not easy to become self-sufficient, but that’s what a lot of us have to do. Socially, mentally, emotionally, logistically self-sufficient. Because the rest of the world doesn’t do a very good job of dealing with us, and it’s well nigh impossible to communicate to them what we’re experiencing and what we need. It’s all a tall order, of course. And not everyone can manage. It helps if you have at least one person in your life you can talk freely to, to work through your issues and come up with better alternatives and “patches” for when things break down. But not everyone has that. It is ironic, isn’t it? The very people who could use some extra help, can’t really expect it. It makes me tired, just thinking about it. So, that said, I’ve got some stuff I have to do.